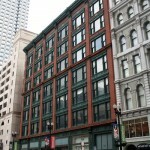 This fantastic brick and cast iron building was once the headquarters of the Oliver Typewriter Company. 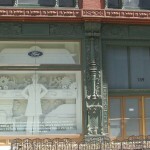 The building lay abandoned for several years in the late 1980’s and 1990’s. It found it’s use when the Oriental Theatre was rehabilitated, though. The stage for the theatre was expanded into the interior of the Oliver Building. 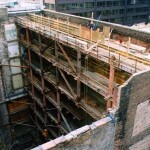 The remaining portion of the building became exit space as well as storage for the theatre. 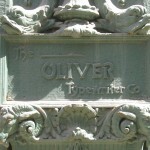 The historic facade of the building was restored, including recasting the logo plates with the Oliver Typewriter name. Images courtesy of Brian Rich and Daniel P. Coffey & Associates, Ltd. Work completed by Brian Rich at Daniel P. Coffey & Associates, Ltd.